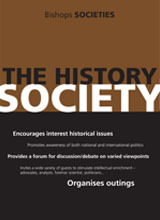 The History Society is open to all students, regardless of grade or age or whether they take history as a subject. The presence at our meetings of other staff members or the parents of students is also welcomed. The History Society’s purpose is to invoke a greater interest among students at Bishops for the study of history, besides promoting more awareness and knowledge of both national and international politics. It also provides for those senior students who are interested in historical or political issues, with some forum where they can pursue intellectual enrichment pertinent to historical/political studies, but have been constrained from fitting history into their subject choices. The specialist presenter is invited and covers his/her specific topic within 45 minutes to an hour. Thereafter the Society’s members are encouraged to pose questions regarding the presentation or the viewpoints expounded therein. DA Minister of Defence, David Maynier, was our guest and spoke at length concerning the vagaries of even politicians like himself with a specific defence brief finding it difficult to ascertain the current state of the South African National Defence Force, this in terms of its combat-readiness. Several History Society members attended an evening public presentation at the Cape Town Holocaust Centre. The speaker was Sir Richard Evans, Regius Professor of History at Cambridge University. The subject being Evans’ role as an expert witness for the defence in a highly publicised libel case during 2000, when American historian Deborah Lipstadt was sued by David Irving, a British military historian, who, during the late 1980s onwards, began to acquire notoriety as a “holocaust denier”. A previous meeting had hosted historian R.W. Johnson, who spoke to members about Julius Malema; the highly controversial former ANC youth league politician. He covered the topic of: Who or what Malema represents. The main thrust of our visitor’s argument, entirely accurate as events were to prove, was that he personally considered Malema an overrated force and personality within the ANC’s power structures and who in time, was very likely to experience harsh disciplining from the party’s leaders. Towards the end of last year, DA Shadow Minister of Defence, David Maynier was our guest and he spoke at length concerning the difficulties for even a briefed and portfolio-dedicated politician like himself, with a specific defence party-political office, successfully drawing information from official sources regarding the current state of the South African National Defence Force. This particularly in terms of SANDF combat-readiness: Namely the extent to which it is capable of fulfilling its most primary role: The defence of South Africa against internal or external aggressors. Mr Maynier pointed out several obvious glaring problems that are visible or documented. For example, many SANDF personnel, most particularly the rank and file of the army, are being neglected; such is manifested in terms of their shoddy service conditions. Mr Maynier also spoke how components of the SA Air Force are being shamelessly exploited by certain senior government members receiving regular outrageously expensive flights across the globe, with seldom any justifiable explanations. The current combat capacity of the SANDF was such that it would struggle to defend this country against any reasonably well armed aggressor; the numerous African peace-keeping missions do not signify the SANDF is battle-ready. In short, the SANDF from 1994 appears to have mutated into a kind of “armed social welfare agency”, rather than a professional force tasked with defending the sovereignty of the nation. It always includes the most extraordinarily high ratio of generals and admirals to troops, with far too few junior officers; compared to the armed forces of the United States, Britain or any other properly balanced military - an alarming picture indeed. The History Society members under Chairman Jack Nebe, participating in his final meeting, thanked Mr Maynier for the talk and presented to him the customary gift. On Wednesday, 6 February this year 2013), the History Society heard and viewed a presentation by Daniel Silke, a well known local political and economics analyst. My Silke provided some projections as to potential future trends in these areas during the first half of this century. Underpinning his calculated speculations was the oft-stated, often (in this author’s opinion) intellectually superficial, supposed “truism”, that change is inevitable and should therefore be anticipated and accommodated as opposed to resisted/ resented. Mr Silke qualified his support of such by outlining some startling demographic trends anticipated over the following half century, along with his views concerning important shifts that have already occurring within the most important national economies. For example, the likely global consequences pertaining to the swelling Chinese and Indian economies particularly in relation to the “old” first World economic hegemony, conventionally understood as referring to United States, Europe and Japan. Mr Silke expected American economic and cultural influence to wane over the following half century, as opposed to the emergence of the Chinese economy in particular, matching and ultimately exceeding that of the United States. Besides commenting upon other emerging economic giants under the acronym MIST: Malaysia, Indonesia, South Korea and Turkey; Mr Silke also perceived what he believed constituted justifiable relevance and local optimism regarding the involvement of South Africa in the BRICS economic collaboration: Brazil, Russia, Indonesia, China and South Africa. Indeed besides South Africa, Mr Silke viewed the economic future of several African countries in a most optimistic light. Mr Silke’s outlook that technology would proliferate further in ameliorating material aspects of the human condition is not unique; although he bolstered such with several startling examples thereof. However, with historical studies as a guide, Mr Silke acknowledged that “black swans” (unpredictable, unforeseen, dramatic events that make, or have made, a marked difference to human society/international relations) remain an important “unknown” factor. Very pointedly, Mr Silke analysis was not constructed within a “prophet of doom– type” paradigm, which often marks these kind of sweeping political/economic projections. Important factors such as terrorism and the possibility of resource wars were largely absent or played down; as were issues such as the ongoing instabilities within the Middle East particularly: From the yet uncertain “Arab Spring” consequences, to the on-going hostility directed towards the Israeli state by its various enemies. History Society members in attendance plied Mr Silke with questions and opinions; he remarked to me later that he was extremely impressed at the quality of the boys’ contributions. It was an intellectually stimulating evening for all those present; Thomas Orton, acting as Chairman, presented Mr Silke with a bottle of wine in gratitude for facilitating such a stimulating presentation and debate. 7 May 2013; During a History Society meeting held in the middle of last term, our guest was Mr Michael Morris, an experienced journalist from the Cape Argus who edits the daily letter page and also contributes or collaborates in the writing of the editorials. Mr Morris is involved in similar roles with the Weekend Argus. He described the process by which letters are selected for publication, with priority usually given to correspondence that replies directly to issues currently under debate within the newspaper’s articles or editorials. Mr Morris who has worked for the Argus over three decades, also referred to the changes of ownership in South African newspapers during this period. And to reasons why the Cape Argus shifted last year from an evening “broadsheet” to the “compact” format, now selling two editions during both morning and afternoon. Mr Morris discussed issues regarding his own concerns of the Secrecy Bill, which was at the time still in the process of being formally ratified. Mr Morris has also completed two books: One on the history of the Cape Argus, besides a pictorial representation, with an accompanying text, on twentieth century South African History with emphasis being upon the rise and fall of the previous government’s racial policies. Mr Morris kindly presented copies of both books to the History Society. Students attending – some forty in all, found particular interest in Mr Morris’s explanation and illustration of journalistic short-hand, used for rapid note taking during pre-technology days when journalists worked armed just with a notebook and pen. 24 July: The History Society hosted Mrs Hilary Van der Vyver, a local resident and retired teacher, who in years gone past did occasional teacher substitution for Bishops staff. Mrs Van der Vyver gave an illustrated presentation on Squadron Leader Pat Pattle, one of the leading Commonwealth fighter air aces from the Second World War. Pattle was a South African who in pre-war year had battled to get admission to flying training with the tiny South African Air Force. He subsequently joined the Royal Air Force and became one of its fighter pilots, being posted to Egypt shortly before war broke out in Europe. Pattle therefore did all of his wartime combat flying in the western desert and Mediterranean theatres of the Second World War. Pattle was a pilot of superior skills, particularly aerial marksmanship, besides his considerable leadership ability. He was killed in mid-1941 while fighting over Greece during the Nazi invasion of this country. Mrs Van der Vyfer recently donated a plaque in Pattle’s honour to his old school, Graeme College in Grahamstown. Her talk demonstrated that besides being an informative outline of a long-forgotten South African war hero, it also illustrated how this and other conflicts provided many remarkable personal stories of courage and endurance. As Samuel Wolski said at the conclusion – probably none of the students present would ever have heard about Pat Pattle – one pilot from a global war fought seventy years ago. But one useful biographical study considering our grade nines study World War Two in some detail. Two meetings have so far occurred this year; During January Warrant Officer Keith Chandler of the Diep River SA Police Services station, together with a female reservist constable colleague addressed a group of History Society members on the kinds of crimes which some teenagers might find themselves either drawn towards or may encounter as bystanders. Unsurprisingly narcotic crime figured prominently and the police personal brought along a wide range of illegal substance samples for the boys to view, ranging from various varieties of cannabis or dagga as we commonly know the term, to various illegal drugs such as methamphetamine and heroine. Warrant Officer Chandler who has served for over twenty five years as a regular policeman, outlined in graphic detail the seizure of such substances and the grim court processes awaiting individuals arrested therewith. He also explained a range of aspects regarding the law, not least the potential consequences of the public drinking of alcohol in prohibited places; public drunkenness; dealing with petty but potentially violent thieves (of cell phones for example) to advice on the management of aggressive police personnel who in the course of their duties threaten to be unnecessary heavy-handed towards the public. On 5 March well known Advocate Jeremy Gauntlett spoke about the law in SA and how it operates within the Constitution and separation powers at legislative, executive and judicial levels. The History Society meets once, sometimes twice, a term at 19:30 in Dr Rodney Warwick’s classroom (K1). Meetings are announced by Pink Notice and a poster. The next meeting takes place during the second term when it is hoped that Prof Hermann Giliomee will be speaking on his views of what can be interpreted from the 2014 General Election results.